If you have experienced a situation, when you need to remove the background of a picture, you know how frustrating it may be. If you don’t have a professional image editing software like Photoshop, it can even feel like mission impossible. And even if you have one, you may need to spend a lot of time, learning how to correctly remove the background from the image. However, it is luckily not as complicated as it may seem at first glance. The truth is that there are many online photo background removers available. Photo Scissors – it’s an interactive cutout tool for removing background from pictures. Simply upload your image, mark the foreground and background areas and their algorithm takes care of details. Use the feathering function to smooth the edges. You can also change the background color – either to a solid color of your choice or upload a new background image. Save your picture as a png file. It’s free. The disadvantage is that it cannot be used for big files. The maximum file size is 5 MB. Malabi – a very quick and easy-to-use tool for removing background from image. Not exactly free. However, it’s almost free. You can remove background from 5 pictures for just 2$ a month. This is the result you might expect. It took me just one minute to remove background from this image. Rather impressive. Burner Bonanza – quickly removes the background from any image or photo. First removes the background automatically, then you can touch up your image manually to improve the result. To access the free service, you will need to sign in. Also has its paid version for professionals – starting from 9.95 $/month. Lunapic – go to Edit->Transparent and select the color you want to remove. May be a good solution for removing a solid color background, but not so convenient for multicolor backgrounds. Ultimate Background Eraser for Android – there are a bunch of many background eraser apps in Google Play Store. And all of them have rather similar functionality and features. I tested several of them, but this one was the most effective. You can use either its magic wand feature that removes the area of similar color automatically or select a particular area to remove specific areas. A cool feature is that this app shows a magnifying glass every time you press the screen. It is like zoom but only works in a particular area where you are pressing your finger. Therefore, it’s much easier to make adjustments. Moreover, when finished, you can add text and emojis to personalize it. Magic Eraser Background Editor for Apple users – remove the background of any picture with just a few taps and save as PNG or JPG. Just touch where you want to remove, and the “Magic Wand” function removes the area of similar color automatically. 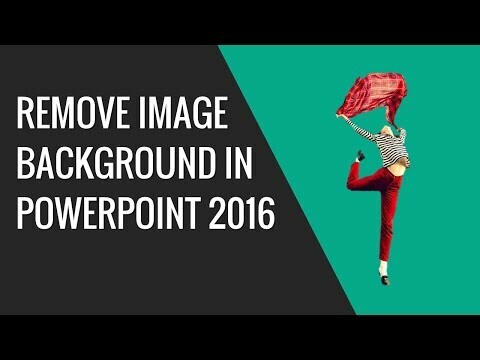 However, my favorite tool that I use for removing image backgrounds is PowerPoint. As you can see from the video below, it is very easy to use. If you already have PowerPoint on your computer, you don’t need any other tools. Of course, it won’t provide a perfect PhotoShop quality, but it will give a result good enough for web banners and social posts. The same functionality is also available in Microsoft Word. Do you need to create images and simple banners for your webpage, blog, and social media? The good news is – you don’t need to hire a designer or buy expensive software to create visuals for the web. You can do it YOURSELF and with FREE tools, thanks to the different resources that are available on the Internet. Get my free ebook 100+ Free Tools to Create Visuals for Web & Social Media and learn how. Marketing professional, blogger, book author and Udemy instructor. Can Websites Create Websites? 3 Website Builders That are Powered by Artificial Intelligence. Check this online background tool it’s amazing. Glad to see the online photo scissor is the first site to remove background from any image but others are not free. So it’s better to add free of cost website for making image transparent. I like suggest you Editphotosforfree’s new background removing tool (http://editphotosforfree.com/photoapps/make-image-transparent) which is free, easy, fast with premium features. Thank you for your comment and suggestion! All tools that are listed in this article are free (except Malabi that costs 2$). Of course some of them have also paid plans, but you don’t need to use them. awesome post . i might to try it. Thanks for your long detail about Photoshop Background Removal. I highly recommend your work and its very helpful.